5 Ways Congress Might Shore Up Health Insurance Markets : Shots - Health News Lawmakers looking to stabilize the health insurance exchanges may consider a number of proposals — including pushing young adults off a parent's plan or letting people buy into Medicare and Medicaid. 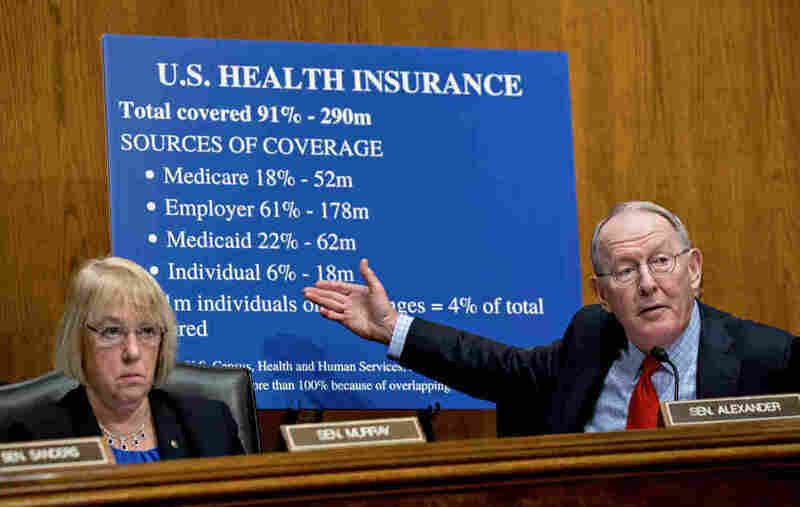 Republican Sen. Lamar Alexander chairs the Senate's Health, Education, Labor and Pensions committee; Sen. Patty Murray is the committee's ranking Democrat. With Republican efforts to "repeal and replace" the Affordable Care Act stalled, tentative bipartisan initiatives are in the works to stabilize the fragile individual insurance market that serves roughly 17 million Americans. The Senate Health, Education, Labor and Pensions Committee says it plans to launch hearings next week to stabilize premiums in the individual insurance market — hearings that will feature state governors and insurance commissioners. A bipartisan group in the House is also working to come up with compromise proposals. Both before and after Obamacare, this portion of the insurance market — which serves people who don't get coverage through work or the government — has proved problematic. Before the ACA, many people with pre-existing health conditions could not get insurance at any price. Currently, consumers in the individual market often face higher out-of-pocket costs and have fewer choices of health care providers and insurers than people buying individual policies have faced in past years. More than 12 million people buy that insurance through the ACA's marketplaces, while 5 million more buy it outside of the exchanges. Policymakers generally agree on what immediate efforts to stabilize the market might include. At the top of most lists is prompt federal payment of the subsidies to insurers known as "cost reduction payments." These are the payments that reimburse insurers for the discounts on copayments and deductibles they are required by law to give to their low-income customers. Insurers also want the federal government to continue enforcing the requirement that most Americans either have insurance or pay a tax penalty. The government also needs to work hard to get uninsured people to sign up for coverage during the upcoming open enrollment period, from Nov. 1 to Dec. 15, insurers insist. Those federal efforts are essential, the firms say, to keeping enough healthy customers in the mix to defray the costs of beneficiaries who have high medical needs. Getting slightly younger people into Medicare, the federal program for the disabled and Americans 65 and older, is a longtime goal of Democrats. It dates at least to President Bill Clinton's administration and was nearly included in the Affordable Care Act in 2010. Note that a Medicare buy-in is not exactly the same as a public option, which many Democrats, including former President Barack Obama, have embraced. A true public option would offer government coverage to people of any age. Still, simply lowering the age for Medicare eligibility (whether by allowing people to purchase coverage early or by letting them join on the same terms as those who are 65) is controversial. Some Democrats support it as a first step toward a single-payer, Medicare-for-all system. Most Republicans oppose it on those same grounds — they see it as a step toward government-run health care. But proponents argue it would help the current individual market by excluding the oldest people, thereby lowering the average age of the pool of people within that particular health plan. Since older patients, on average, cost more to insure, the change could lower premiums for everyone left in the ACA market. That's the stated goal of a Medicare buy-in bill introduced earlier this month by Sen. Debbie Stabenow, D-Mich., and seven other Democratic senators. Their bill would allow customers ages 55-64 in the ACA market to purchase Medicare coverage instead — but would also let them use ACA tax credits if they are eligible for those. The cost of such policies has not been worked out. "The way we've structured it actually both helps Medicare by having younger people in that pool, and it helps private insurance by taking higher-cost individuals out of their pool," Stabenow told The Detroit News. Conservative health analysts don't buy that, though. "This is just a way of saying we're going to take these people out of the exchanges and put them where there are bigger subsidies," said Joseph Antos at the conservative-leaning American Enterprise Institute. 2. Allow people to "buy in" to Medicaid. An alternative to letting people buy in to Medicare is letting them buy into Medicaid, the joint federal-state program for those with low incomes. Medicaid buy-ins already exist — for example, in 2005 Congress passed the Family Opportunity Act, which allows families earning up to three times the poverty level to purchase Medicaid coverage for their disabled children who aren't otherwise eligible. Medicaid has typically provided richer benefits for those with disabilities than private health insurance. Earlier this year, Gov. Brian Sandoval, R-Nev., vetoed a bill that would have allowed Nevada residents to buy Medicaid coverage through the state's insurance exchange. Now Sen. Brian Schatz, D-Hawaii, is pushing for a federal Medicaid buy-in plan, which he described to Vox.com last week. It would give states the option to allow people who make more than the current Medicaid eligibility thresholds to pay a premium to join the program. Like the Medicare buy-in bill, Schatz's proposal would allow those who qualify for federal tax credits to use them to pay the premiums. The proposal would also raise the reimbursements that Medicaid pays to doctors, hospitals and other health care providers to the same level it pays them to treat Medicare patients. Traditionally, low Medicaid payment rates have kept many doctors — particularly specialists — from accepting Medicaid patients. The idea of a further Medicaid expansion does not sit well with conservative policy analysts. "It's completely unworkable," Avik Roy, of the Foundation for Research on Equal Opportunity, told Vox. He predicted such a plan would raise Medicaid spending by $2 trillion over 10 years. 3. Get younger adults off their parents' insurance and back into the individual market. Allowing young adults up to age 26 to stay on their parents' health plans is unquestionably one of the most popular ACA provisions. Democrats have touted it proudly while Republicans have dared not touch it in almost any of their overhaul proposals. Yet what has been a boon to 3 million young adults (and a relief to their parents) has come at a cost to the individual marketplace itself, where only an estimated 28 percent of those buying coverage in state exchanges were ages 18 to 34 in 2016. That is well below the 40 percent most analysts said was necessary to keep the market stable. "Frankly, it was really stupid," to keep those young people out of the individual market, said Antos of AEI. The result has been a lack of people in the risk pool who are "young, healthy and whose parents will pay their premiums." But rolling back that piece of the law might be nearly impossible, said Antos, because "this is a middle-class giveaway." One clear shortcoming of the individual marketplace is a lack of insurer competition, particularly in rural areas. While it now appears that every county in the U.S. will have at least one insurer offering health coverage for the coming year, the percentage of counties with only one insurer seems certain to rise from 2017's 33 percent. A little-noticed provision in one of the versions of the Senate GOP health bill that failed to pass in July would have allowed people to use money from tax-preferred health savings accounts to pay their insurance premiums. A proposal from a group of ideologically diverse health care specialists included a similar idea. HSAs are linked to high-deductible insurance plans, and consumers use the money in their account to pay their out-of-pocket expenses. The money put into an account and the earnings are not taxable. With a few exceptions, people with HSAs have not been allowed to use those funds to pay monthly premiums. But the change would be one way to provide relief to people who a) buy their own insurance, b) earn too much to get federal premium subsidies and c) cannot deduct premiums from their taxes because they are not technically self-employed. Such people, although likely relatively small in number, have been disproportionately hurt by rising premiums in the individual market since the ACA took full effect. Roy Ramthun, who helped design HSAs as a Senate staffer in the early 2000s and helped implement them while at the Treasury Department during the George W. Bush administration, said that, generally, "Republicans have preferred to subsidize insurance premiums through tax deductions and credits and leave the HSA for out-of-pocket expenses." Allowing premiums to be paid from HSA funds, Ramthun said, "could eat up the entire balance of the account and leave nothing for out-of-pocket expenses." There are limits to how much money can be put into an HSA. For 2017, the maximum is $3,400 for an individual and $6,750 for a family.